The Nikon J1 compact system camera has boasted some impressive early sales figures, including making it to the top of the best-seller list in the UK before Christmas. Last week, the Nikon J1 also managed to set the record for the highest number of models sold in one week, beating the previous records set by other manufacturer's models. That means that the camera sold more in a single week than any other individual mirrorless compact system camera since the segment of the market launched back in 2008. 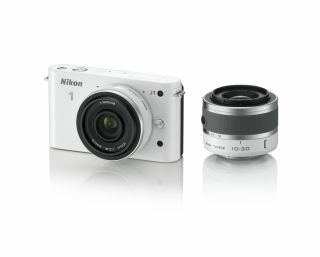 After just 10 weeks on sale, Nikon also claims that is now the number two best-selling brand for compact system cameras. Speaking to TechRadar, Jeremy Gilbert, Nikon UK's Group Marketing Manager, said, "It's early days and we're still finding out about the customer, and who's buying what. Clearly a market for CSC cameras exists, and that might be people who are not necessarily interested in 'photography', but just want to take great pictures." "These people aren't necessarily our traditional customers, but what we need to do next is plan the best way to move forward with them. We're doing research to monitor customer feedback." Nikon joined the compact system market relatively late on, when compared with other manufacturers such as Olympus, Sony and Panasonic, introducing the Nikon 1 V1 and J1 back in October. The J1 is the entry level model of the two cameras, featuring a 10.1 million pixel CMOS sensor and retailing for around £550 with an included 10-30mm kit lens.